The children squeal with delight as a piglet clambers over the back of its brother to get a better place in the sun. A huge sow slowly rolls over in the gloopy mud, grunts and flops back into contented slumber. A tussle breaks out as three youngsters nip ears and legs before deciding it’s all too much effort and collapse in a piggy heap on top of each other. 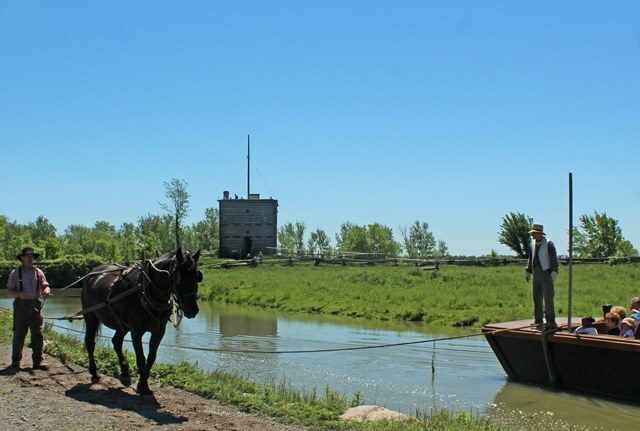 Just another day of buccolic pleasure in Upper Canada Village, not far from Morrisberg in Ontario. 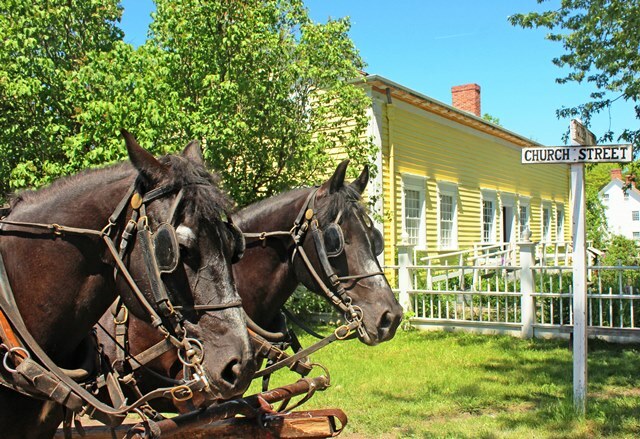 Less than 60 miles (90kms) from Ottawa, Upper Canada Village is a unique visitor attraction depicting life in Ontario around 1866, when the pace of life was much slower. Many of the 40 historical buildings were transported here from nearby villages which were flooded to make way for the St Lawrence Seaway in the 1950s. It gives a vivid idea of 19th century agricultural practices including caring for livestock, growing crops and harvesting vegetables. Attractive gardens showcase the plants and flowers that would have been grown in the summer. Staff dressed in clothing of the period carry out domestic tasks and discuss what social life, music, religion and politics would have been like at the time. They demonstrate how cheese, bread, shoes, tin jugs, brooms, furniture, dresses and hats were made. 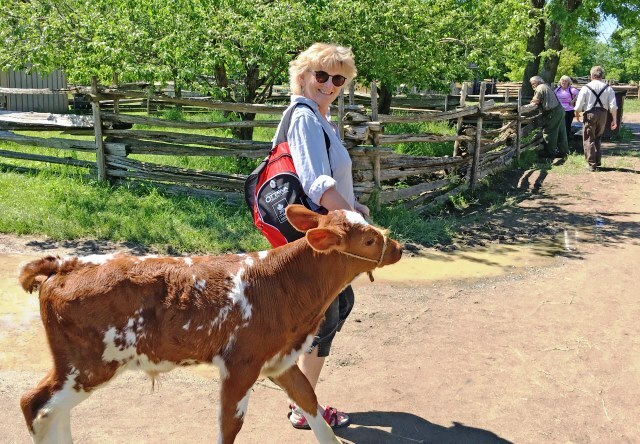 I’m visiting Upper Canada Village with local travel blogger Cindy Baker of Travel Bliss Now on a day out from Ottawa. It’s a school trip day and lots of children run around the grounds, stopping to pat horses and watch sheep being shorn. Wandering along sunny paths and through shady nooks we pass the Woollen Factory and Saw Mill before reaching elegant yellow house. 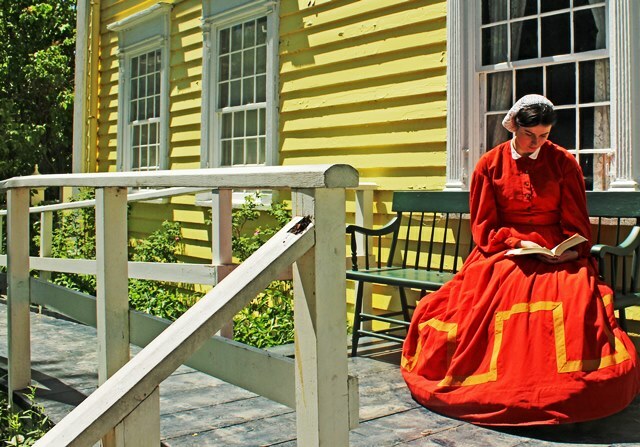 On the veranda a young woman in a vivid orange dress sits reading a book. Inside Robertson Home we learn how a well-to-do middle-class family would have lived. The parlour has ornate decor with family portraits and lots of knick-knackery typical of the Victorian era. Further on we find the Bakery where a young man is showing how the bread is made. Later in the day we see the baker’s horse-drawn cart collect the bread; it’s sold on site and served in the Village Cafe and at Willards Hotel. We climb aboard and listen to the gentle shuck of the boat on the water as we pass the Pier Light. A flock of Canada Geese pecking around in the grass, honking as we pass and overhead birds swoop and dive across the clear blue sky. Time seems to slow down and the ‘real world’ fades away as we drift along. Beyond the canal, the wide open waters of the Saint Lawrence River glitter and ripple as ship sails past; an incongruous reminder of 21st century Canada. The tower of white-painted Christ Church peaks out above the trees near the canal. 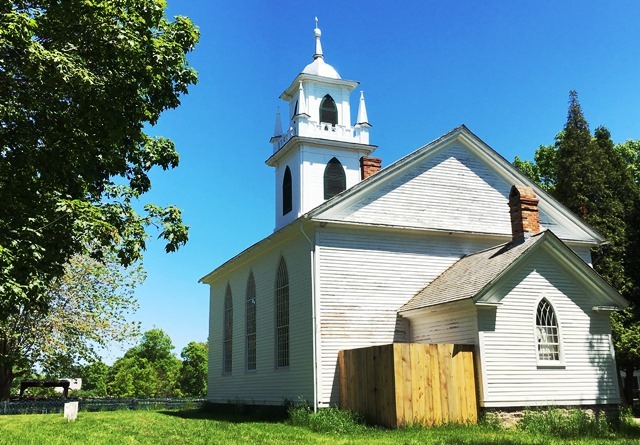 On the front cover an excellent book, ‘A Village Arising – the Story of the Building of Upper Canada 1957-1961 and After‘ by Peter Stokes, there’s a photo of the church being hauled along the road from Moulinette to the site of Upper Canada Village on top of flat-bed trucks. We peak inside; the interior is similar to a Scottish Presbyterian kirk and includes box pews, a gallery and a cast iron stove. 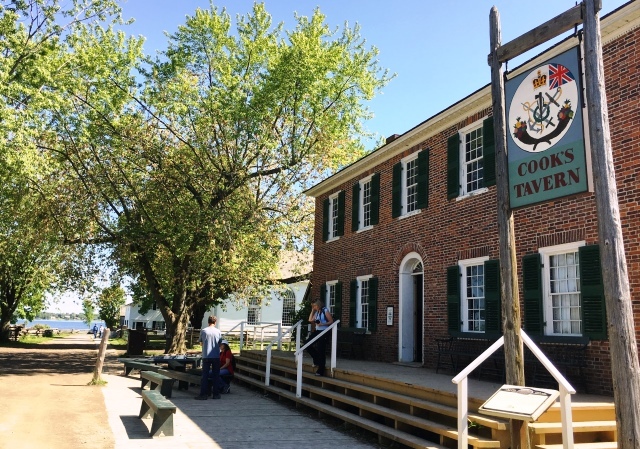 Just round the corner from the church is brick built Cook’s Tavern, which serves Ginger Beer and Sarsaparilla, based on the popular 19th century tonic made from the root of a South American plant (Genus Smilax). Commonly referred to as “root beer”, these tonics contained a variety of roots, such as ginger for tang, sassafras for flavour and sarsaparilla to make it foam. Outside, a few people are waiting for one of the horse-drawn wagons to take them on a 20 minute drive round the village. It’s late afternoon and the school groups have left; the place is quiet, with a tranquil atmosphere very different from the frenetic excitement of the morning. After a full-on day it’s time to go. On our way out, we have a quick look at the gift shop and exhibition centre, which tells the history of the area. 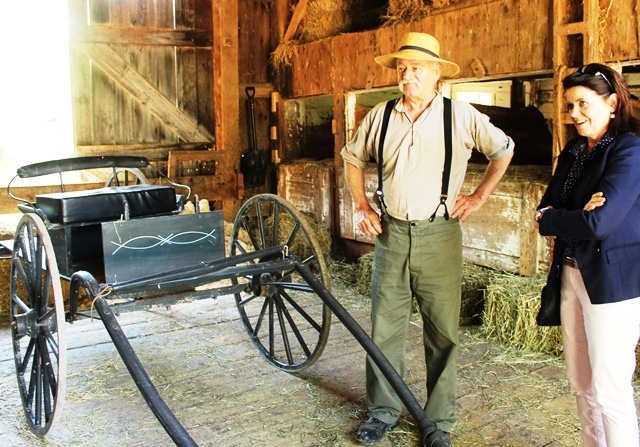 Outside the little train that runs round Upper Canada Village is setting off on its last ride. We stop for a photo of the monument commemorating the Battle of Crysler’s Farm, a nationally significant battle in the War of 1812 that halted the 1813 invasion of Canada. This is just one of the many day trips you can take from Ottawa. I also visited Merrickville, a pretty village on the banks of the Rideau Canal, Diefenbunker, Canada’s Cold War Museum, Fultons Pancake House and Sugar Bush and spent a very relaxing day at Nordik Spa-Nature, a luxury spa at the entrance to Gatineau Park. Many thanks to Susan Le Clair of Upper Canada Village for showing me round and sharing stories about this unique attraction. Grateful thanks also to Air Transat, Destination Canada and Ottawa Tourism for sponsoring my visit to Canada. It was a pleasure to explore more of Canada, a country of unforgettable experiences. Check out Canada Keep Exploring to discover more about where to go and what to do in Ottawa. Return flights from Gatwick to Toronto from £346 (October 2017) and £349 (May 2018) per person with Air Transat. Canadian Affair offers an 8-day package tour Ontario Taster Holiday which includes 2 nights in Ottawa. 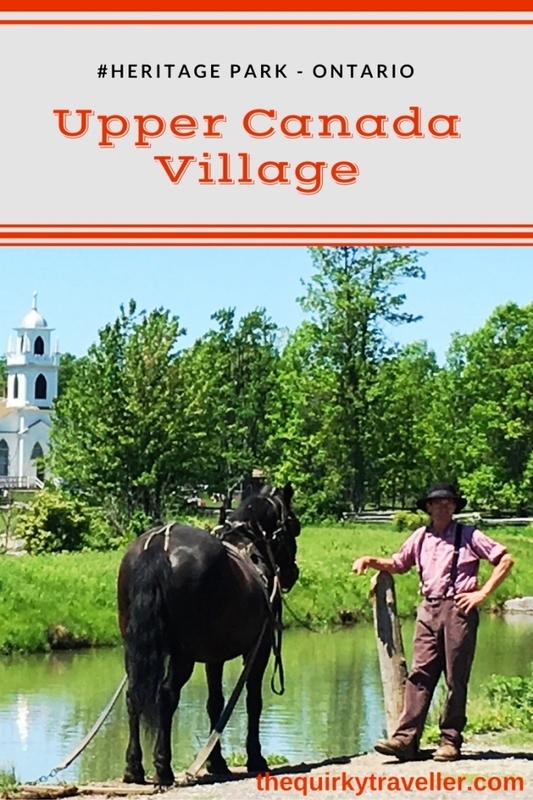 Upper Canada Village – LOVE IT? PIN IT! This is one of the very best sites of its kind I’ve every been to. Unlike some places, the staff are not ‘actors’ but people doing real tasks that they clearly enjoy. The engage ‘in character’ but are also happy to talk as modern-day workers, very knowledgeable, answering questions as best they can and very friendly. We were very lucky with the weather so spent a lot of time outdoors, but nearly all the crafts etc are indoors so it is most definitely an all-weather day out. Sounds like fascinating day out. And looks like you had a great weather for it. That cow is so cute! What an interesting place! 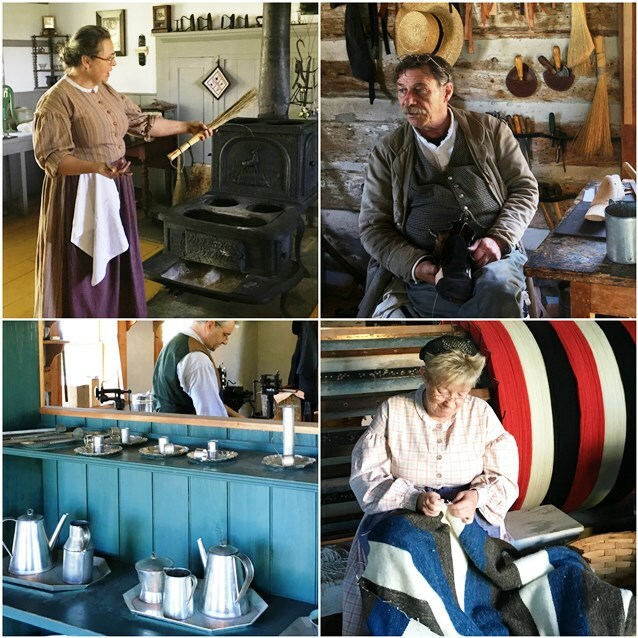 I went to a similar style living history site in Fort William Historical Park near Thunder Bay and it was fascinating to go back in time and see how people used to live. It’s fascinating isn’t it to get such insights Lucy. I’ve not seen one on such a large scale in the UK. That was such a fabulous day in the sunshine and you’ve captured it perfectly! I agree – – what makes this place so special is that the people are actually growing the grain, making the bread, and crafting the shoes so they can give a good context of what it was like. And they all clearly loved being there. As did I! It was a pleasure to share it with you Cindy 🙂 I really enjoyed learning more about your fascinating country and also staying in Ottawa – I can see why you love living there so much. I do hope to visit again another time. Now that does look like a fun day out. Like the idea of being towed along the canal by a horse! Looks like you had another fantastic experience in Canada. I’m a big fan of root beer, so will have to pop into the Cook’s Tavern when I’m there. 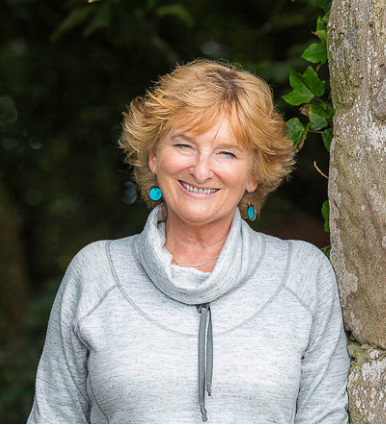 What a fun day out – perhaps you could settle into this lifestyle and become farmer Zoe, bake bread and brew beer! Somehow that sounds very appealing now Heather! 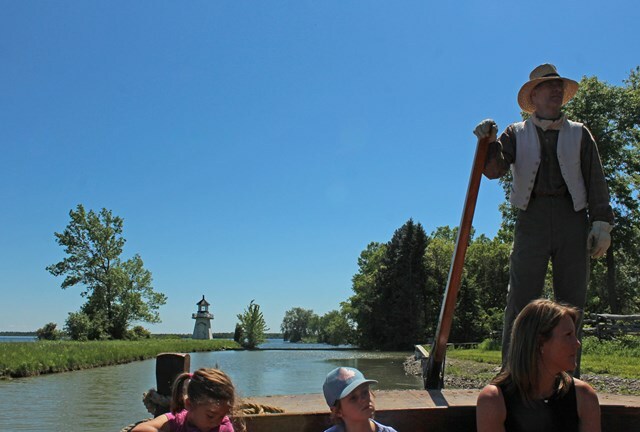 Looks an outstanding location to learn anout aspects of Canadian history while having a great day out. You’re absolutely right Barry. We learnt a lot in the most entertaining way and loved the whole day out. Great excursion from Ottawa.